From the moment you step foot into this beautifully appointed 2 bedroom/1 bath cottage you are immediately drawn to the front room to stand in awe of the outstanding panoramic views of the Olympic Mountains. Stunning views from every picture window, a beautiful propane fireplace and comfy furniture will have you sitting back and relaxing in record time. The cottage itself is well appointed for 4 guests, beautifully refurbished with bamboo hardwood floors throughout living areas and bedrooms. The charming kitchen and dining area are ready for preparing and enjoying your meals together either inside or outside on the lovely backyard patio. The Master bedroom boasts a comfy king size bed and the second bedroom has two twin beds. Both rooms have large windows that look out at the mountains. There is also a single bath with a tub/shower combo located in the hall just outside the bedrooms. Bring your bike and enjoy long rides through the Sequim Dungeness Valley where lavender fields dot the landscape, mountains rise up before you and bald eagles soar over the sea. The famous Dungeness Spit, one of the world's longest natural sand spits is next door and within easy walking distance from the cottage. Enjoy hiking on the west side of the spit and experiencing the richness of sea birds, shore birds and mammals in their natural habitat on the inner protected harbor of the National Wildlife Sanctuary. Harbor seals are known to come up on the beach to rest and even the occasional Orca whale can be seen swimming off the Spit. If you love to golf, the famous Cedars at Dungeness is located just minutes away and also has two wonderful restaurants featuring seafood and steaks along with an extensive beer, wine and cocktail menu. Bring the kiddos and take a drive through the wild at the Olympic Game Farm filled with American Buffalo, elk, zebras, bears and even a tiger or two. Kids will have the pleasure of feeding the animals up close and personal from your car door window as you drive through the park. An experience loved by both young and old. If you want to get out on the water, bring your own kayaks or rent one from Go Xpeditions located at the John Wayne Marina. Great selection of kayaks, SUP boards and small watercraft for exploring Sequim Bay. Downtown Sequim's coffee houses, local restaurants and shopping are just 15 minutes from the cottage. The downtown area is often bustling with locals and tourists alike enjoying weekly art walks, farmer's markets, outdoor dining, gift shops, museum, and local theater productions. Further adventures into the Olympic National Park are just a day's trip away. Hurricane Ridge, the closest entrance, is just 35 minutes away. Lake Crescent and Sol Duc Hot Springs can be reached within 45 min to 1.25 hours from the cottage and the Hoh Rain Forest and Pacific coastline beaches can be reached within a 2.5 - 3 hour drive. Arrive back at the Olympic View Cottage and soak up the peaceful serenity around you. Located on five acres, the cottage also backs up to a wonderful cedar forest perfect for exploring. 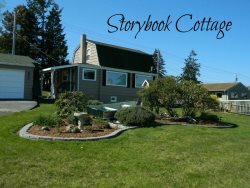 The perfect cottage for seeking a much needed respite from the business of life. Carolyn was very helpful in making a choice on where to stay. We had a magical week seeing the sights of the Peninsula. Coming back to a comfortable place to stay just added to our experience. The view of the Olympics was spectacular! Check in time is 4pm at our office in Sequim; Check out is by 11 am.